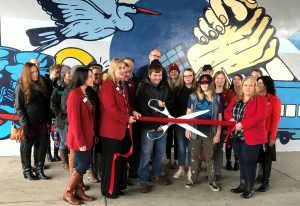 The new downtown Kelso mural, created by local youth, was celebrated at a ribbon cutting on October 25. Development of the mural was an investment in Kelso and Longview youth through a paid work experience. The youth learn about their local history and art during field trips to the Cowlitz Historical Museum and through visits by local government officials. The fun and interactive four-week program gave them the opportunity to gain communications, leadership, and teamwork skills that will be valuable as they seek employment. The project was a collaboration between the City of Kelso, Workforce Southwest Washington, Cowlitz Economic Development Council, Goodwill of Olympics and Rainier Region, Educational Service District 112, Urban Artworks, and The Honorable Frank L. and Arlene G. Price Foundation. Many others also played a role in making the project a success, among them, Ray Pyle, owner of Catlin Properties who graciously allowed the students and artist to use his equipment and facilities for storage. A special thank you to the artist, Forest Wolf Kell, for his assistance and instruction in helping the young adults represent their interpretation of the City of Kelso and realize their vision for the mural. The youth were the guiding force behind the symbolism and themes and Forest translated their ideas into a composition. This mural is meant to represent five youths’ interpretation of the City of Kelso and their time spent there. Each element and its interaction with the whole is used with a great amount of thought and intentionality. The youth were the guiding force behind the symbolism and themes while I translated their ideas into a fully realized composition. When talking with the group about Kelso, the phrase “helping hand” was mentioned on more than one occasion when talking about Kelso’s community. Because of that, we decided on the symbol of clasped hands as the central focus of the composition to symbolize Kelso’s community and the “helping hand” mentality. The hand with the plaid sleeve and older appearance is meant to allude to the thought that the older generation of Kelso will act as the catalyst for progress for the youth and future generations. The arrows going in opposite directions are a symbol for the dynamic of Kelso and how it functions as a key stop in the transfer of resources as they travel up and down the West Coast. In addition, these arrows are meant to represent the relationship between Kelso and Longview, which the youth felt was important to highlight. The trains stand as a fairly literal representation, but the group was adamant that the railroad was a key part of Kelso throughout its history (hence the key atop the second train car). The two cars moving toward the right side of the composition are symbolic of progress. The book and the Kelso School District logo are meant to suggest education is vital to this progress. The two train cars are moving in the direction of the sun, which is meant to symbolize “genuine contentment,” as put by one of the youth. The boots, the logs, the dip net and the chains are a representation of Kelso’s rich logging and fishing industries that led to the growth of the City and community. The house is a symbol of place, home and growth, which was afforded by those industries. The lock with the founding date of Kelso is symbolic of the perseverance of the history of Kelso and how it has been used to shape the City and its ideals even to this day. The lock is depicted in the unlocked position to lead to the notion that the potential of Kelso was unlocked in that year of Kelso’s founding. The stairs leading up to the clasped hands symbolize the ever-ascending community and the hope that Kelso continues to foster that community. The heron is a symbol of freedom and is meant to relate to the river system that runs in and around Kelso. The foot wearing a modern shoe is representative of the youth of Kelso and their path into continuing Kelso’s growth. The foot in the shoe is wearing a plaid sock that the youth added as a nod to Kelso’s history and to show that no matter what direction the progress, it will always be influenced by the history and foundation. The two streetlights on either side of the composition are used to suggest the notion that the history of Kelso will always be in the light, whereas the future which will be led by its youth will soon be in the light in new and positive ways. Overall this composition is meant to highlight some of Kelso’s history through symbols and objects that are personal to this group of youth and hopefully many others in the City. In addition, it is meant to show these youths’ hope for the future of Kelso and its community as they quickly become the new generation of Kelso community members.